I love brussels sprouts because they are so versatile in taking on other flavor profiles. As I mentioned in my Fall Foods post yesterday, one of my most viewed recipes was for Brussels Sprouts with Raisins, Pine Nuts, and Parmesan. That recipe brings out mostly sweet elements, with red wine and raisins leading the way; the salty punch of parmesan adds a contrasting taste and embellishes the pine nuts. This recipe today is a complete 180 from that. Here we have a base of creamy onions, garlic, and pancetta. Those flavors create a glaze and infuse into hearty greens like sprouts and kale. The salty pancetta brings out the natural sweetness of the butternut squash. It’s a rich dish that is brightened up with fresh orange zest, so it doesn’t feel heavy. It is a great choice for a side dish or starter salad as the weather turns colder. Heat a large saute pan on medium heat with a drizzle of olive oil. Add the onion, shallot, garlic, thyme, and pancetta. Saute on medium heat for 4-5 minutes, or until the onions begin to caramelize. This should be a slow cooking process to bring out the fat from the pancetta and to slowly cook the onions. Add the sprouts, kale, and squash to the pan. Bring the heat up just a bit to medium-high. Stir well while you saute the ingredients so that all the flavors incorporate. Cook for 5 minutes; the sprouts should start to brown. Add the stock to the pan and reduce the heat back to medium. 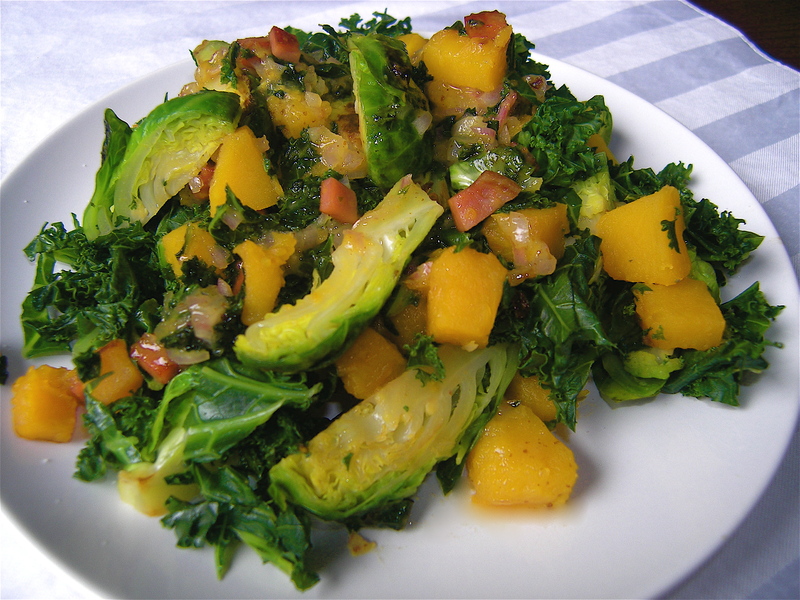 Cover and cook for 5 minutes so that the squash and sprouts soften. Remove the lid, add the orange zest and juice, stir well, and season with salt and pepper.